This review is written by Francis Clarke, a freelance video game journalist who’s portfolio is available here. Like old games and want to contribute? Click here to find out how to become a writer for Retro Garden. Prior to the early nineties, developer Microprose was best known for its military simulation games such as the famous F-15 strike eagle and the Gunship series. While incredibly successful in their own right, Sid Meier’s successful series of simulation games from Civilization onwards were to become the crowning achievement of the company. Railroad Tycoon never reached the dizzying heights of Civilisation, but it is a great game in its own right, even if the idea does sound like you need to own several anoraks and spend far too much time hanging around in railway stations to really enjoy. Railroad Tycoon simulates the early beginnings of the Railroad Industry, and gives players a chance to build their own rail empire from scratch, dealing with stocks and shares, industry, competition and of course, the railways themselves. It’s funny that something that sounds like it would be more of a chore than a game actually turns out to be an incredibly engrossing experience, even if you didn’t ever have any particular interest in railways or history beforehand. Railroad was one of the first strategy games to offer varying difficulty levels set by the player which determined your final score. As well as choosing a general mode of play you could also set further options such as making the economy simpler, or turning off train collisions. Although setting all the options to easy neuters most of the challenge on offer, it does give new players a chance to get used to the controls and the gameplay – a vital inclusion considering in game tutorials were still in their infancy. Although not the first Simulation game by a long way, Railroad Tycoon was one of first to combine several smaller elements into a larger game. Stocks and Shares were set up quite separate from the railways you were building, as was your interaction with industry. They all use the same pool of cash however, and decisions made in one section of the game always end up affecting the others, so careful consideration has to be put into each decision. This micromanagement gives the game more depth than earlier games like Simcity, but it also makes it more complicated, and the idea of becoming an 19th century railroad builder isn’t quite as instantly appealing or accessible as becoming the mayor of a city, and you’ll need to start learning about stocks and company takeovers, things which you players might not be immediately familiar with. It takes longer to get into – and more impromptu visits to the instruction manual – to become good at the game, but it rewards that hard work and initial difficulty curve with something enjoyable and unique, and not beaten in terms of depth until years later. 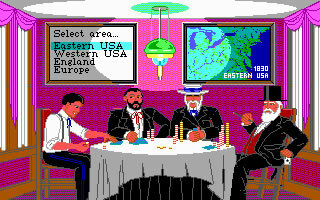 Graphically the game is run from a top down perspective over a map of one of the games four regions – East and West America, Europe and England, themselves made up of a number of tiles representing anything from a mine to a farm or local town. Different levels of zoom provide different information; although you’ll end up playing from the closest zoom most often as it’s the easiest place to access more information about each tile. Exactly what these tiles represent isn’t always clear, a coal mine or farm doesn’t always look like what you might imagine, but you quickly get used to them and after a few hours of playing you can identify them with reasonable ease. Graphics are presented in VGA – although there are plenty of lower modes available – and are accompanied by pleasant but underwhelming sound effects and music. In terms of gameplay and graphics, the game has dated remarkably well. The economy simulation however has several large flaws which players who have grown up on games like Industry Giant and Capitalism might find it hard to deal with. For example, each town always demands an infinite amount of resources, and towns can’t produce goods from raw materials without you transporting them to another town first. Despite these obvious flaws and a less than accurate historical representation of the nineteenth century, Railroad is every bit as addictive and enjoyable as its modern counterpart – Sid Meier’s Railroads! The interface is where the game has suffered most. The game can be controlled via the mouse and keyboard or using the keyboard alone, but either way modern players will find the interface cumbersome at best. Track is laid predominantly with the numpad making laptop play difficult, and virtually all the statistical information is accessed from drop down menus and involves venturing into a variety of different screens instead of being implemented onto the main map. The mouse makes navigation between menus easier and saves the player from learning shortcuts, but with a few right click options and no way to lay the track using the mouse, its usefulness is limited. If you’re looking for a copy of Railroad Tycoon, try to grab an original rather than a newer repackaged version as these are more likely to have the manual in PDF format, and the game is much easier when you can pick up and browse everything. The game works on windows XP if you select the MCGA graphics option, although this does mean you sacrifice in game animation options, so it’s better to play it using a DOS emulator, or on original hardware. Sid Meier was the nineties version of Will Wright; a games developer who people actually knew by name. Even better, the name was synonymous with high quality, in depth and unique gaming experience. Railroad Tycoon wasn’t his magnum opus, but it was one of the grandfathers of modern simulation games, and one that shouldn’t be missed, even if the idea of managing Victorian railway lines isn’t immediately making you jump our of your seat with excitement. Railroad Tycoon was the first PC game I played to any substantial degree. At the time I did most of my gaming on the Amiga, Atari ST and Sega Mega Drive — from an aesthetic point of view it felt like taking a step backwards, but the gameplay was as addictive as crack. From that moment on I was a little more willing to give PC games a try. By the time I hit Star Trek: 25th Anniversary, my journey to the Dark Side of the Force (at least from the Amiga community’s perspective) was complete. Then came X-Wing and Doom and I never looked back. Anyway, back to RT. I tried some of the sequels but they never captivated me in quite the same way. The demo of Railroads! looked like fun, but I’m still a little hesitant to grab the full version. Instead, I’ll just fire up the original RT and still have a lot of fun with it. @Retroblique what you said could have come out of my mouth! Including the bit about re-firing up my Railroad Tycoon Deluxe. As an avid PC games collector I still have the original and Deluxe boxes and 200 page manuals, along with the flash cards from the original Railroad’s game! I could say the same for nearly every Microprose game released in the 90’s. Surely the golden age of PC gaming!